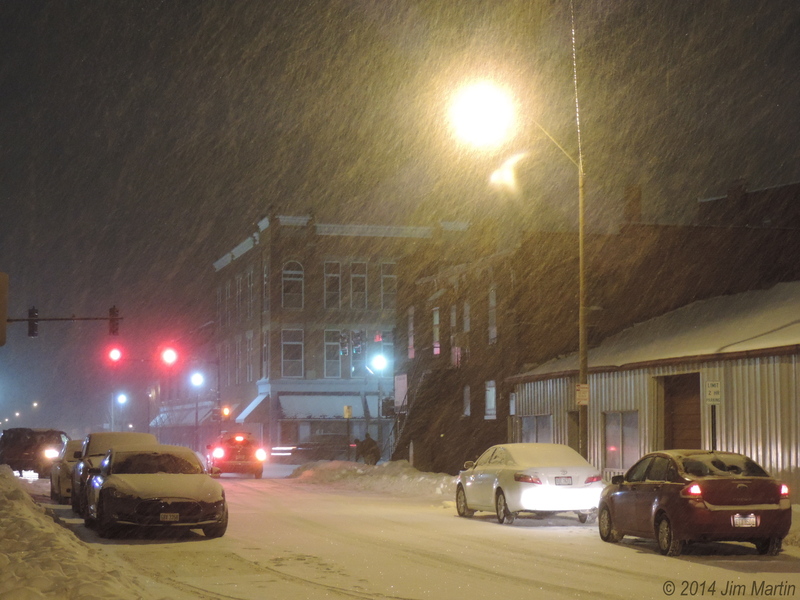 DEEP SNOW PACK: A deep snow pack is still in place here in Findlay and across Northwest Ohio. The morning visible satellite picture picks up on this very well. Even with the snow pack being shown here, there is plentiful sunshine across the city and the region as well. High temperatures today will reach the middle teens with sunshine staying out in full force. 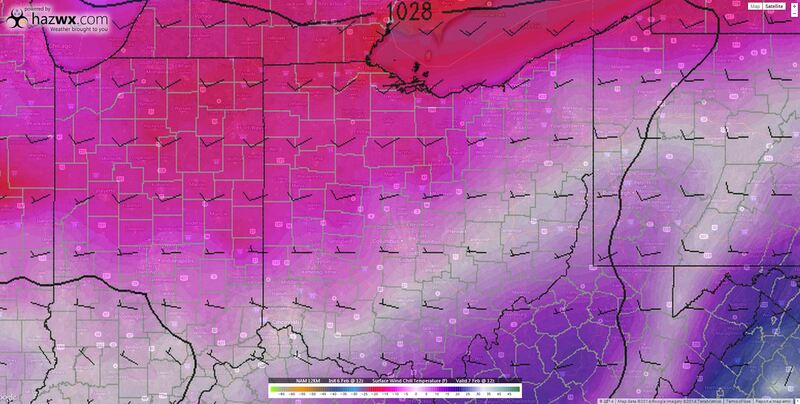 Another frigid night is ahead for the Findlay area, as well as Northwest Ohio. With skies remaining mainly clear, the temperatures once again will be dropping down to around zero. 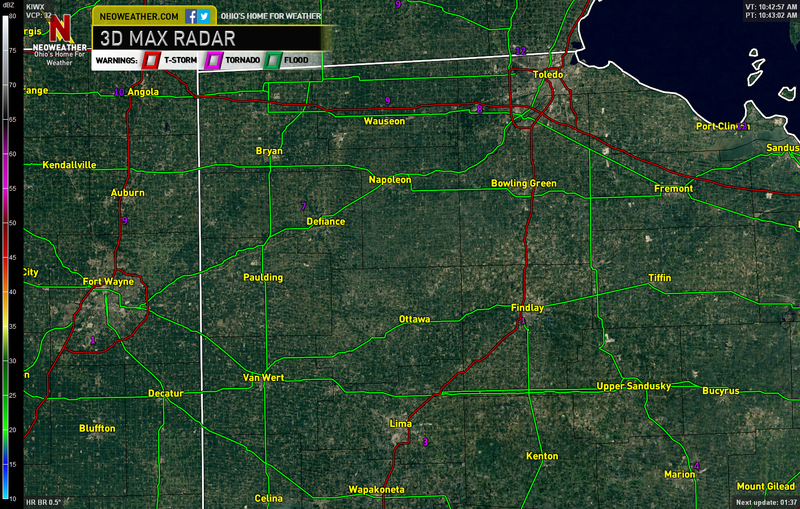 RADAR PICTURE: We have a clear scan on weather radar this morning across Northwest Ohio. A few spots in the region (including Findlay) are still hovering around zero degrees here at this hour. The next chance for light snowfall currently appears to be on Friday. However, it does not look like that the amount of snowfall being forecasted will not be significant. We will keep you updated here at Weather or Knot with the latest weather information. Have a great Tuesday! 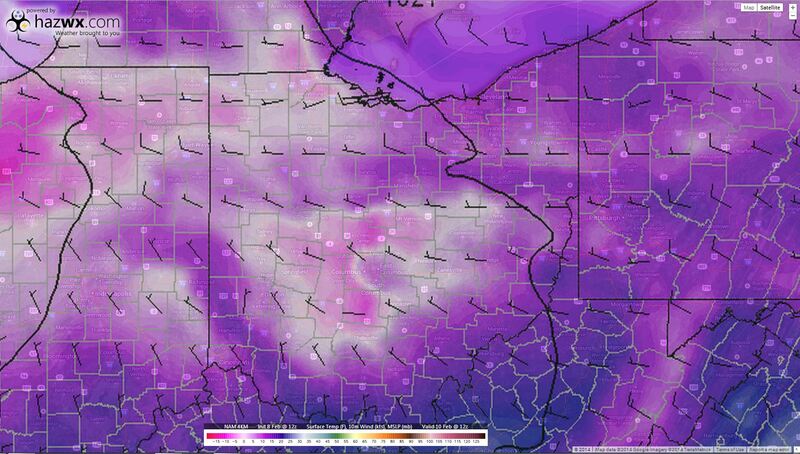 There may be slight differences in the wind chill temperatures depicted by these forecast models. 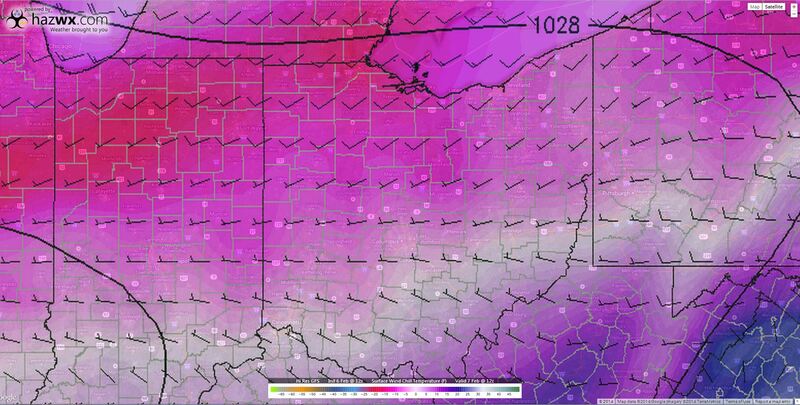 Either way you cut it, it is going to be bone-chilling cold on Friday morning across Northwest Ohio. Dress warm when heading out tomorrow morning to either work or school. 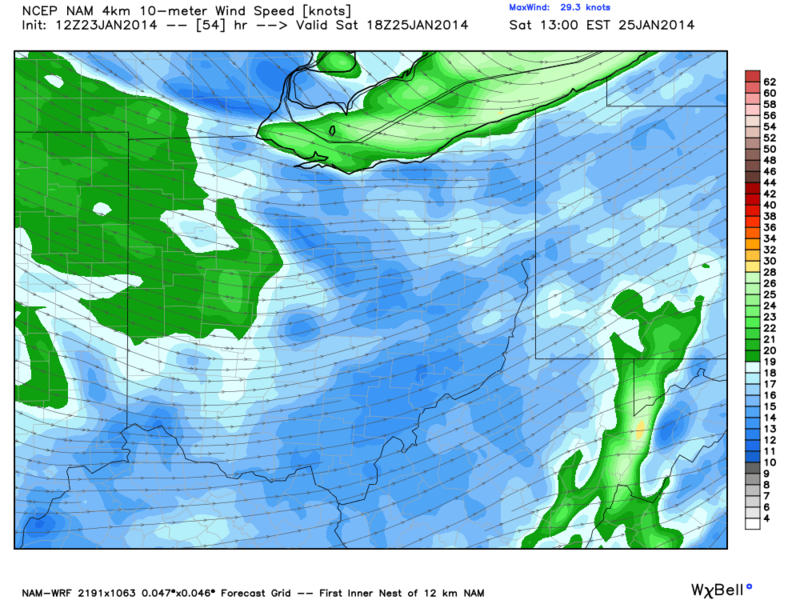 The first component for this storm setup is always the wind. 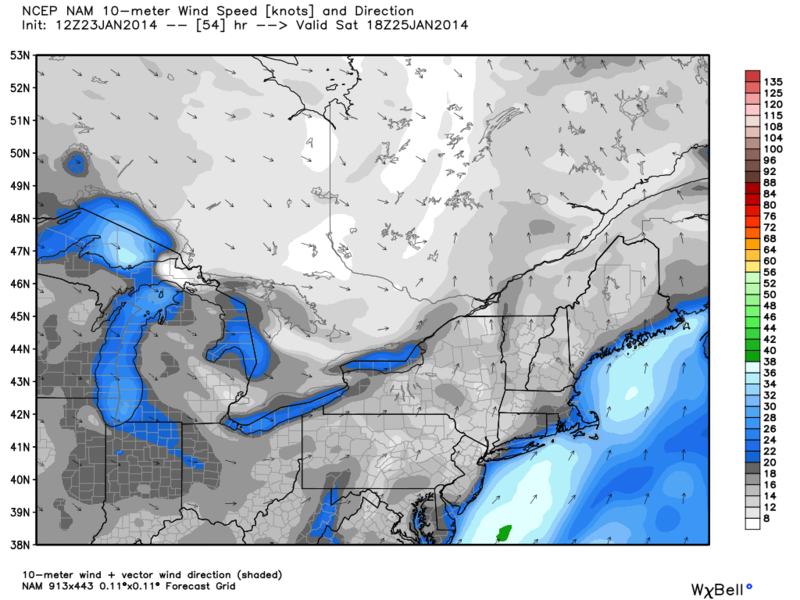 The 12z 4k NAM, and 12z NAM, show the potential of winds sustained 20-30 mph, with gusts exceeding 35-40 mph. 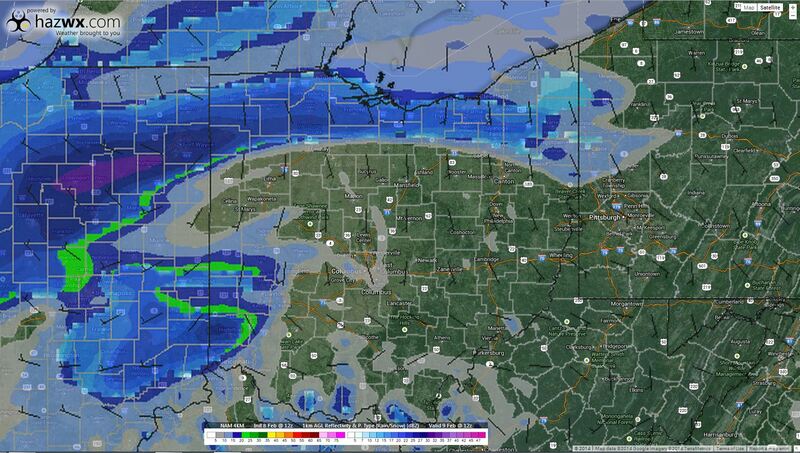 This could easily end up resulting in near-blizzard at times this weekend across Northwest Ohio. 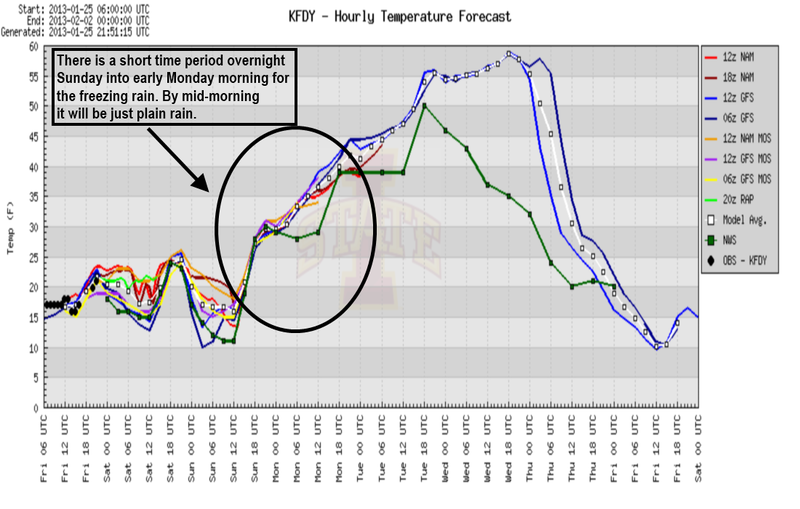 Although the forecasted amounts by 8:00 AM Monday morning do differ some, the point is clear. This snow is likely going to blow and drift very badly throughout the weekend, especially in the open, rural areas of the region. If you do have to travel this weekend, make sure to use common sense on the roads. Stay safe out there. 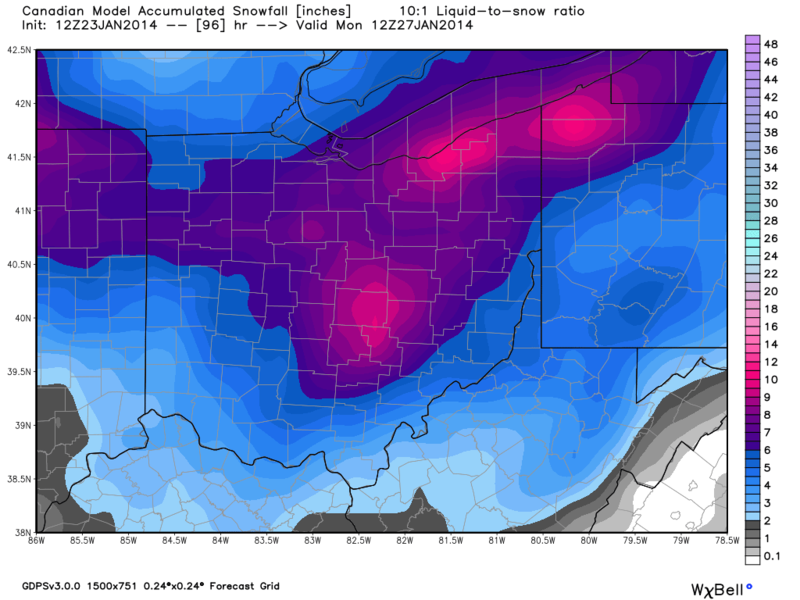 OHIO…NORTHEAST OHIO AND NORTHWEST OHIO. WITH SIGNIFICANT SNOW ACCUMULATIONS POSSIBLE. NORTHERN INDIANA AND SOUTHWEST LOWER MICHIGAN. THERE IS A CHANCE OF SNOW MONDAY. THIS SYSTEM FOR THE MIDDLE PORTIONS OF NEXT WEEK. 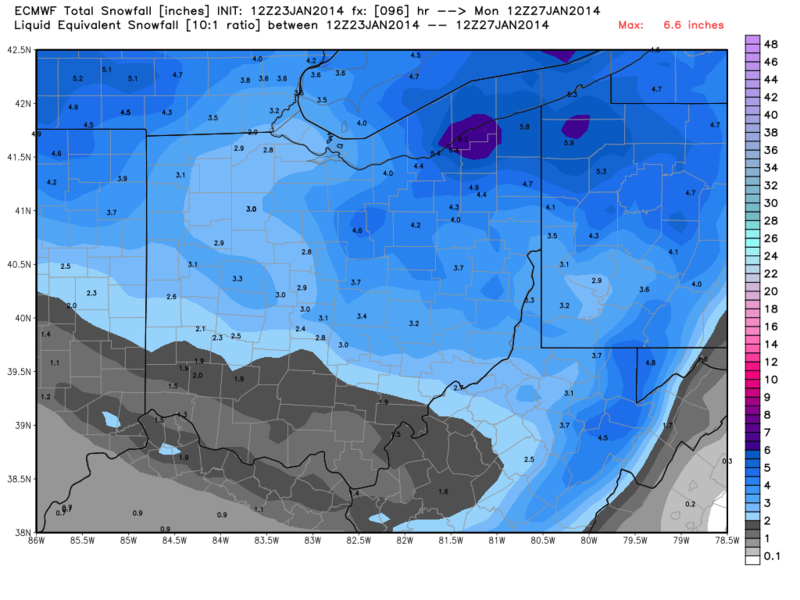 OHIO…SOUTHWEST OHIO AND WEST CENTRAL OHIO. 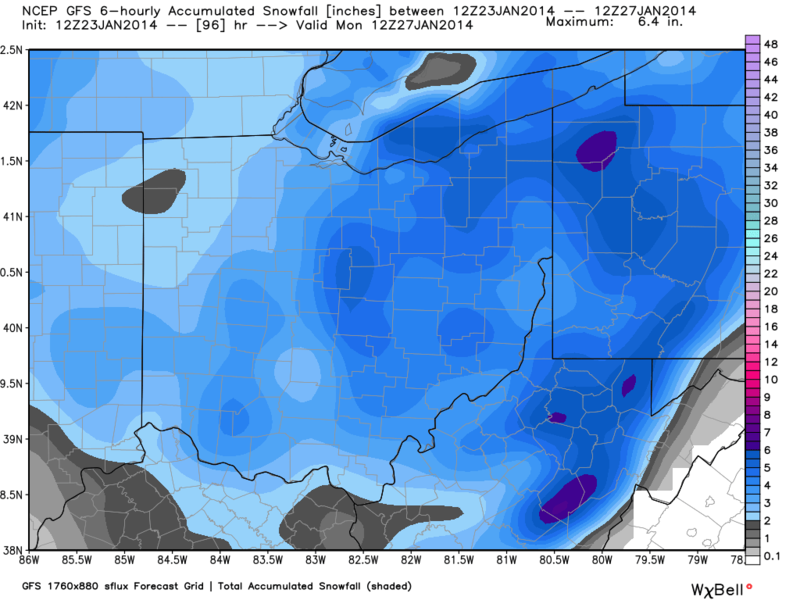 OF SIGNIFICANT SNOW ACCUMULATIONS WITH THIS STORM. Stay with Weather or Knot for the latest information on this pending snowstorm. SPORADIC POWER OUTAGES MAY OCCUR. MONITOR LATER FORECASTS ON THIS DEVELOPING WINTER STORM. OHIO…NORTHEAST OHIO…NORTHWEST OHIO AND NORTHWEST PENNSYLVANIA. FOR UPDATES ON THIS DEVELOPING STORM SYSTEM. Most forecast model runs are hinting at potentially a major snowstorm somewhere in the Great Lakes the middle of this upcoming week. The general idea is there of a big storm to affect the Great Lakes region this upcoming week. 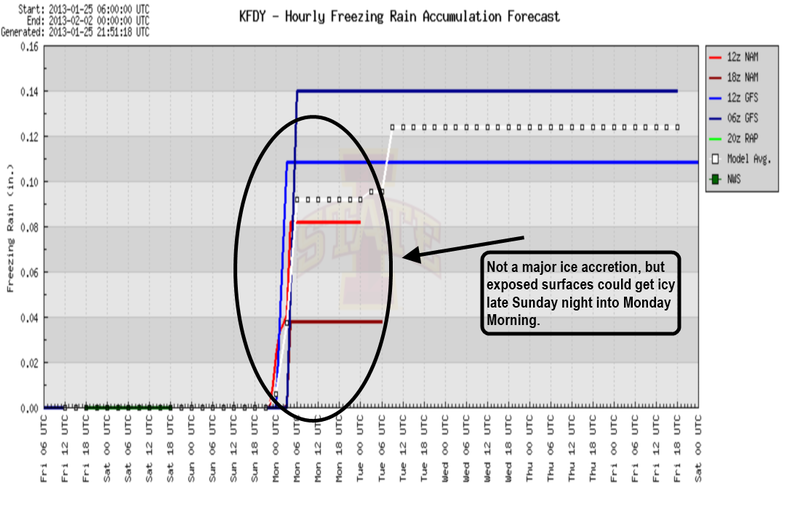 However, this is just a projected forecast model. These are not set in stone. Stay with Weather or Knot for the latest on this developing weather situation for this upcoming week. Have a good evening! These projections are still many days from happening, if they do. However, it is important to give a heads-up. We will be monitoring the situation here in the coming days here on Weather or Knot. Stay tuned.